Some would have said that White Antelope’s people, the Arapaho, had lived far too long, scouring the plains in pursuit of the herds of buffalo that fed them and clothed them. It was a new age; the white man was advancing, had been advancing, for over 20 years across the hunting grounds of the Arapaho, the Cheyenne, and the Sioux. Not many years had passed since gold had been found in the mountains of Colorado, and the white man’s city, Denver, had swelled with thousands of fortune seekers. The shiftless Indian (as the whites thought him), intent only on hunting and war, just wasted this land, just wasted it. He must submit to the white man (whose destiny it was to take the land) or die. The white men of the West despised, and often hated, the “inhuman savages,” as they called the Plains Indians. The Indian, they said, was treacherous, bloodthirsty, cruel, and he stank. Though the white man himself could be cruel and bloodthirsty, his religion and culture condemned both cruelty and blood thirst. The Indian, particularly the warlike plainsman, thought it no indignity to treat an enemy with the utmost cruelty — brutally torturing the living, mutilating and scalping the bodies of the dead. As the white men were driving the Sioux, the Cheyenne, and the Arapaho from their hunting grounds, so had those tribes driven off other, weaker tribes who had dwelt on the plains before them. Yet, when white folk justified broken treaties, cruelty, and massacres by pointing to Indian savagery, it was not so often offended virtue, but greed, that spoke. They [the Indians] are in abject want of food half the year. The travel upon the [Oregon Trail] drives the buffalo off or else confines them to a narrow path during the period of migration, and the different tribes are forced to contend with hostile nations in seeking support for their villages. The women are pinched with want and their children are constantly crying with hunger. The Arapaho and the Cheyenne under Black Kettle had signed a treaty with the United States in 1861; the tribes exchanged hunting lands for subsidies and a small reservation in the area of Sand Creek, Colorado. The reservation, however, proved so poor that the Indians could not feed themselves, and they were dying from epidemics. Cheyenne warriors then began raiding white ranches, stealing cattle. Following one such raid in the spring of 1864, angry white settlers called out the militia, which fired on a band of innocent Cheyenne. This incident led to a general uprising of the Cheyenne and Arapaho, who, in two weeks time, killed and mutilated 200 white settlers and emigrants. Black Kettle knew that his people could not long withstand the power of the United States military, and he approached Major Scott Anthony at Fort Lynn with an offer of peace. Anthony, replying that he had no authority to make peace, told Black Kettle and his people to return to the reservation. The Indian chief, thinking he had received a promise of protection from Anthony, returned to Sand Creek, 40 miles from Fort Lynn. Meanwhile, a former Methodist minister and anti-slavery man, John Chivington, set out at the head of the Third Colorado Volunteers to obey orders “to pursue everywhere and destroy the Cheyenne and Arapahos.” In the early dawn of November 29, Chivington and his men reached Black Kettle’s encampment, where 700 Cheyenne and Arapaho men, women, and children lay sleeping. The soldiers fell on the unsuspecting Indians and began their work of slaughter. The Indians, recovering from their initial shock, fought back doggedly and pushed back the assault. The fighting continued until about four in the afternoon when the soldiers completely overcame the Indians’ defense. Then, according to reports, the soldiers mutilated the corpses of Indian men, women, and children. Two hundred Indians, most of them women and children, died in this “Sand Creek Massacre.” Though Black Kettle escaped, many a brave warrior, including White Antelope, lay among the dead. 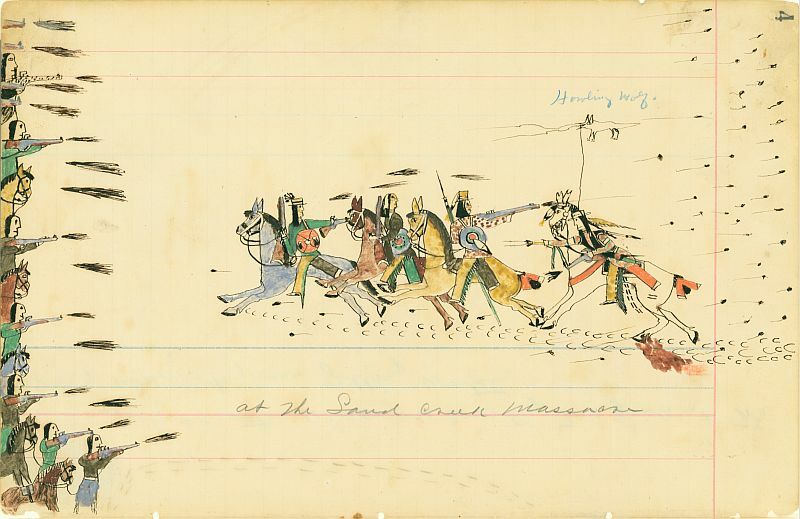 The massacre did not end the war, and sporadic fighting continued even after Black Kettle and other chiefs agreed in a truce in 1865 to move to a reservation in Kansas. Two years later, they signed another treaty, trading their Kansas reservation for two smaller reservations in Indian Territory. I enjoyed the article on the Arapaho history. I have also seen some research by Margaret Coel, on the Arapaho Chief Left Hand, and I think you might enjoy it, as it relates tto this period of struggle.